Sitting is sometimes referred to as “the new smoking” in terms of how it can affect the various parts of the body, especially the spine. The problem with sitting is that extra pressure is placed on the lower back and its supporting discs, joints, muscles, and ligaments, which can increase stiffness, pain, and the likelihood of developing long-term issues that may require medical treatment such as alternatives to spinal fusion surgery. Santa Monica office workers may think they can’t do much about having to be parked in an office chair for multiple hours when they have work to do. 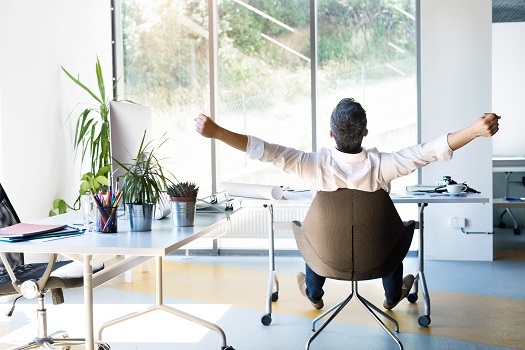 However, there are some unique chair options that can help workers maintain healthy backs. Here are five of them. If standing all day at work isn’t comfortable, consider a sit-to-stand desk converter instead. This way, you’ll be able to alternate between sitting and standing positions throughout your workday. By sitting on an exercise ball, you’ll be constantly engaging your lower back and the muscle groups that support your spine as you shift your position to maintain your balance. The lack of a seat back also forces you to maintain good posture. If you’re uncomfortable with sitting on an exercise ball that tends to roll, consider a variation of this design with an attached base. Also referred to as a balance stool or active stool, an ergonomic stool has a design similar to an exercise ball. It also has a high seat that forces you to half-stand while your feet are on the floor. Your core back-supporting muscles are engaged by a pivoting base and the absence of back support, which also helps with posture. With a kneeling chair, you’ll get a padded seat to maintain your comfort, but your spine will be kept in a neutral position by a design that forces you to sit with your upper legs angled forward as your lower legs bend backward. Some of your body’s weight will be shifted to your knees and shins. To help you get used to this type of chair, try using it on and off throughout your day at first before using it more often. Also, opt for an adjustable kneeling chair so you can find a comfortable position. No matter which of these office chair options you prefer, don’t forget to take some other important steps to keep your back healthy. Make an effort to get up and stretch your spine-supporting muscles as often as possible and get regular exercise during your free time. Avoid sugary snacks and other unhealthy foods that tend to trigger inflammation. If you need more advice on back-friendly seating options in your work environment, consult with a Santa Monica spine surgeon. The spine health experts at The Spine Institute are authorities on how to keep your back healthy, which includes making sure your work setup promotes good posture and supports your spine. Call one of our friendly representatives at 310-828-7757 today to schedule a consultation.